" I love corset wedding gowns! Can I buy a gown that has a zipper in the back and then changing it to a corset lace up back?" Many brides ask this question in wedding forums and to me as a bridal alterations specialist. Perhaps you are a bride who finds a dress you love! Every thing is exactly like you want but the only thing is that it has a zipper closure. Can the zipper be converted to a lace up back? Yes, It can be done depending on how the gown is made. But it is easier to do for a gown that is too small, since it automatically forms an opening in the back, depending on how much too small the gown is. Trying to convert a gown that fits a person, to a corset wedding gown is harder to do because you have to cut out an opening in the back. This may or may not be possible to do for some wedding dresses, because of the inner structure of the gown and the details on the outside. 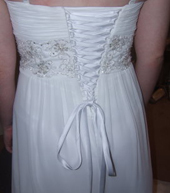 Contact a sewing professional to see if it is possible to do this to your gown. If you want to learn more about which figure types or body shapes benefit from corset wedding dresses, click the link to read this article. The picture to the left is of a gown that a bride had purchased before she became pregnant. The amount of spread you see between the two sides of the gown is the amount the gown was too small. So the solution was to take out the zipper and transform this gown into a corset wedding dress. If you have not purchased a gown, you may want to consider getting a gown 1 to 3 sizes bigger than what you measure for now. It depends on how far along you will be when you get married, and the style of gown you choose. Just make sure you get a qualified sewing professional to convert your dress to a corset wedding gown.